This is definitely not the Sabrina you grew up with! It's official: "Chilling Adventures of Sabrina" looks super spooky — and it's arriving just in time for Halloween! 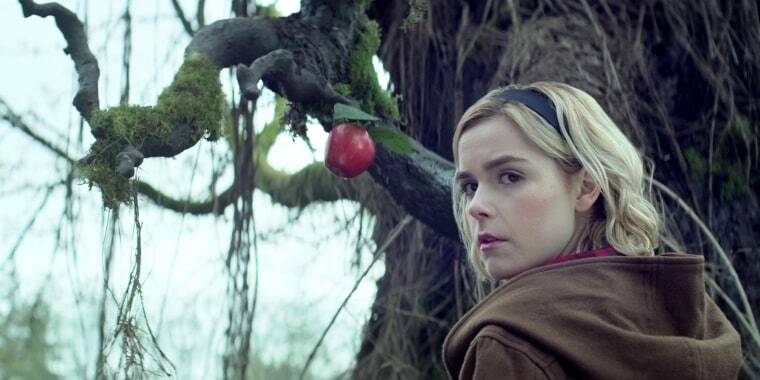 On Wednesday, Netflix released a full-length trailer for the series, which focuses on a half-witch, half-mortal teen named Sabrina Spellman (Kiernan Shipka) who, as her 16th birthday approaches, is forced to choose between a life of witchcraft and life as a normal human. The series is based on the "Sabrina the Teenage Witch" comic books co-written by "Riverdale" creator Roberto Aguirre-Sacasa, the new series' executive producer. But this coming-of-age drama is a much darker take on the character, initially brought to life on TV by Melissa Joan Hart on the ABC/The WB sitcom "Sabrina the Teenage Witch." The new trailer finds Sabrina enjoying fun times with her adolescent friends, including boyfriend Harvey Kinkle (Ross Lynch), but also battling demonic forces and struggling with pressures from her witchy family to complete her dark baptism. "I'm not an evil person," Sabrina explains in one scene, "but these are desperate times." The series also stars Lucy Davis, Miranda Otto, Richard Coyle, Michelle Gomez, and "Perfect Strangers" alum Bronson Pinchot. "Chilling Adventures of Sabrina" premieres October 26 on Netflix — and we can't wait!